By nature I am resistant to change. I have a routine, I plan things out, I make to-do lists and I try my best to stick to them. I am one of those people that practically pulls their hair out when things don’t go according to plan. I firmly believe that routine is good. However, as I grow in life, in my experiences, in my occasional reluctance to fail, and my oftentimes irrational fear of everything outside my comfort zone, I realize that change is something I desperately need to succumb to. Most of the time I never realize how good the change would be for me until I have no choice but to allow the change to happen but I wonder how much better the change would be if I didn’t resist it so much to begin with. In my last post I wrote about how I need to learn how to just trust the answers that God gives me and not fight him on it. The same can be said for the changes that he continues to try and bring in my life that I am so adamant about not accepting all because they weren’t in my plan, or in my schedule for how things are supposed to go. I think I really need to keep reminding myself that just because I develop and formulate a plan it doesn’t mean that it is in line with God’s plan, and his plan trumps mine. I’m starting to realize that a lot of the obstacles and struggles that I have had, or am still having, in building up my career, my life, in the way that I want it to go is because I place those obstacles there myself by not listening and not allowing the things that are going to change my life for the better to just happen. I push against what I don’t know, against what I don’t plan, and I couldn’t be more wrong in doing that. But I am on a journey to learn from the mistakes that I’ve been making and to do better so that things can be better. 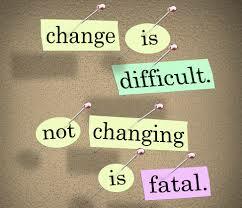 Change is inevitable and to fight it is just resisting whatever good will come along with it. I realize that the magic starts when you just let change happen!